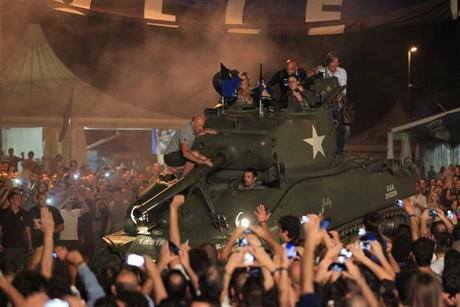 New Atalanta signing Giulio Migliaccio for becoming an “inadvertent protagonist” in a stunt at the Atalanta fans’ pre-season street festival that saw a tank driven over cars painted in the colours of rival clubs Roma and Brescia – and incident into with the Italian FA (FIGC) have since launched an inquiry. “I was inadvertently the protagonist. In a party atmosphere, in among a huge crowd of fans, including lots of women and children, I was invited on board a tank which has been going around for years at the Festa della Dea, parading players and staff to salute the people. “I certainly could not have imagined that, at a certain stage, we would have crushed two cars taken from the scrap yard. I only realised when we were already going over them and, since I could not see since I was high up and at the back, I did not know that they had the symbols of two football clubs on them. A player sincerely apologising for driving a tank around the streets of a city and crushing cars painted in rival club’s colours? Well, we can honestly say that that is a new one on us.